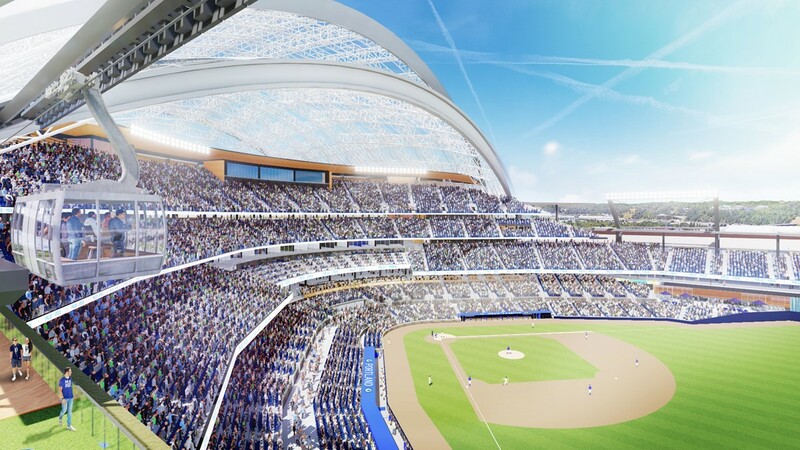 The artist renderings feature a retractable roof, gondola suite and centerfield and home-plate plazas, among other features. The capacity of the ballpark would be between 32,000 and 34,000. PORTLAND, Ore. — Portland Diamond Project announced Thursday afternoon that they've signed an agreement in principle with the Port of Portland to develop the 45-acre Terminal 2 property for a "state-of-the art ballpark," a major step in their effort to bring a Major League Baseball team to Portland. 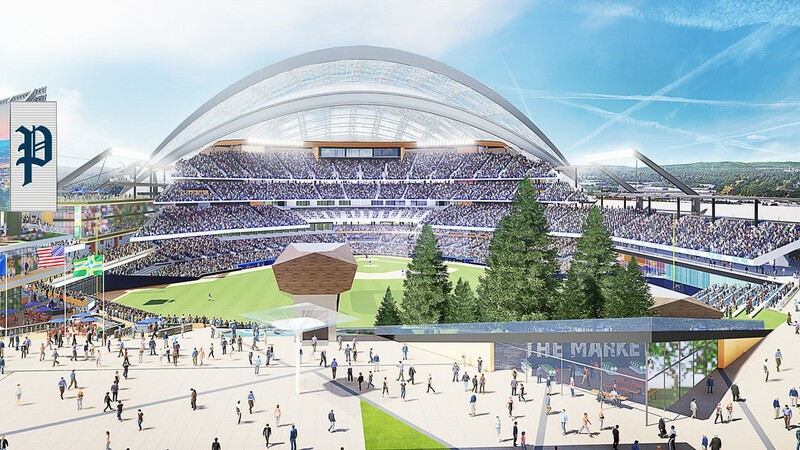 The group also released artist renderings for the stadium, which features a retractable roof, gondola suite, and centerfield and home-plate plazas, among other features. The capacity of the ballpark would be between 32,000 and 34,000, according to John McIsaac, a spokesman for Portland Diamond Project. McIsaac said the group has talked with MLB and he said they "love" the announcement. Portland Diamond Project is targeting 2022 for first pitch. McIsaac said he believes if the group has a stadium, Portland will get a team one way or another. "This is our dream and I think it's possible," he said. 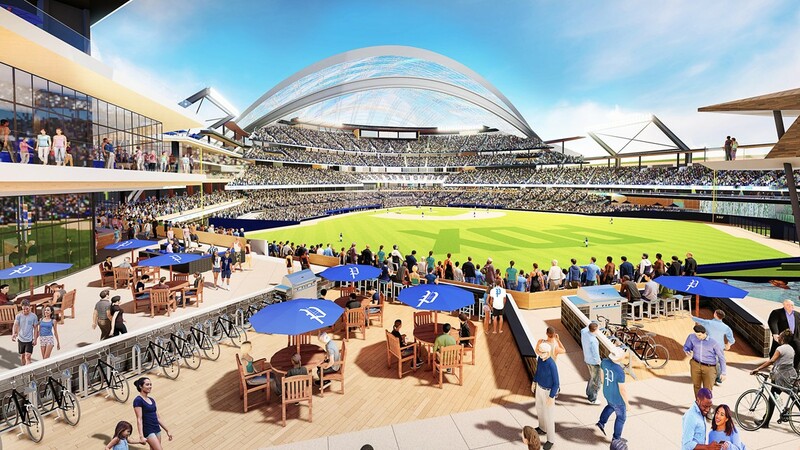 An artist's rendering of the stadium Portland Diamond Project plans to build in Portland as part of their effort to bring an MLB team to the city. 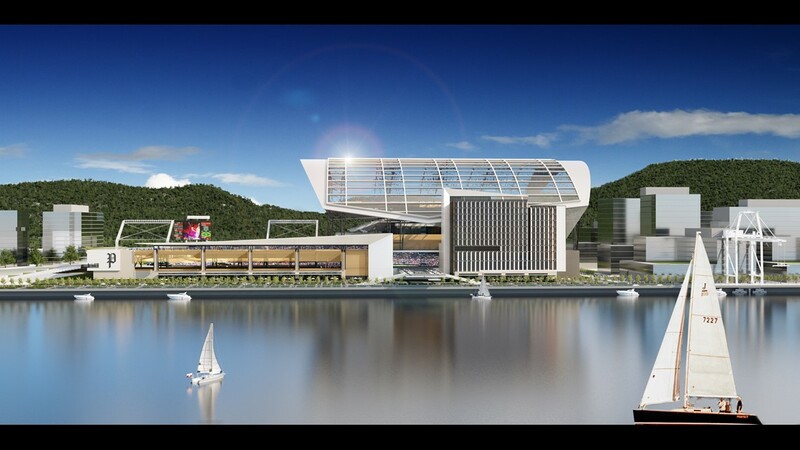 During a June press conference to announce he was investing in the project, Seattle Seahawks quarterback Russell Wilson talked about his desire to see a riverfront stadium. Wilson said he envisioned players hitting home runs into the Willamette River. 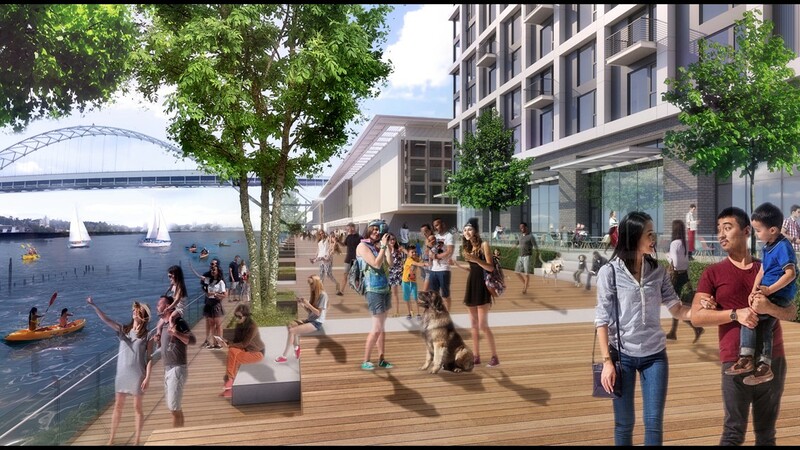 "We believe this has the potential to be a transformative landmark project for this city," said Portland Diamond Project President Craig Cheek. "Building an iconic, state-of-the-art ballpark along the Willamette River will catalyze economic development and capture great views of both the urban scale of the city and regional character of the Pacific Northwest." Cheek said the ballpark will celebrate Portland's unique culture. 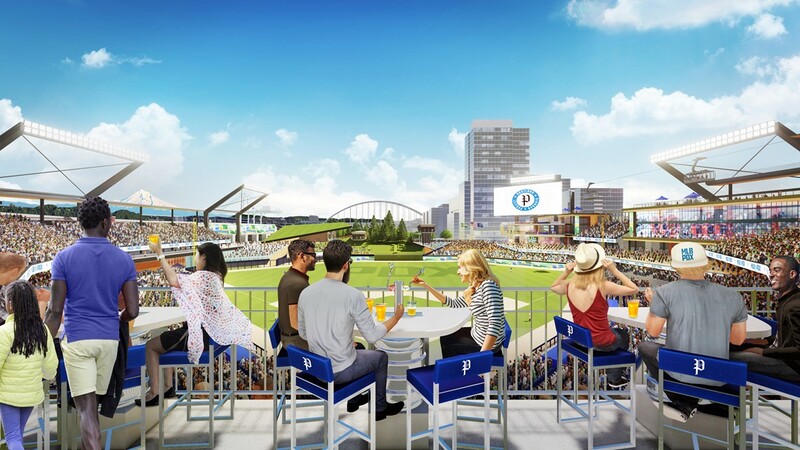 "We're committed to building a sustainable, equitable, and accessible ballpark that reflects what makes Portland such a special place to live,” Cheek said. 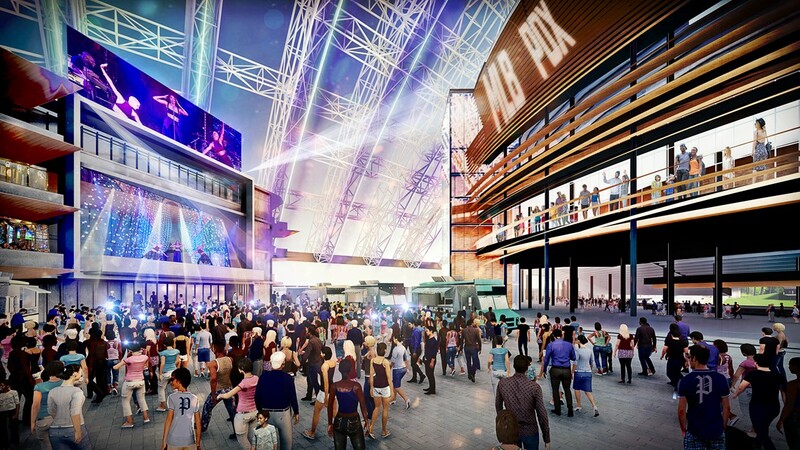 "That means outstanding locally sourced food and beverage amenities, environmentally sustainable construction and operations, opportunities for makers and small businesses, and an atmosphere that celebrates diversity and inclusion and is welcoming to all Portlanders." Curtis Robinhold, executive director of the Port of Portland, said the agreement "creates a new opportunity at Terminal 2." "We're excited about the idea of baseball at Terminal 2 and a unique development on the river, close to downtown Portland," Robinhold said. McIsaac said the group is still doing due diligence on the land, such as environmental studies. But the agreement means the Portland Diamond Project has the sole option to buy the property. "Nobody is going to swoop in and buy it out from under us," McIsaac said. Portland Diamond Project has been working to secure a stadium site for the better part of the year. Last April, the group made two offers for properties: the Portland Public Schools headquarters near the Moda center, and a piece of industrial land in Northwest Portland owned by ESCO Corp.
Portland Diamond Project was one of 10 bidders on the ESCO property but ultimately lost out. The group pulled the Portland Public Schools offer last month after it became clear the group Albina Vision didn’t support a baseball stadium in the neighborhood. 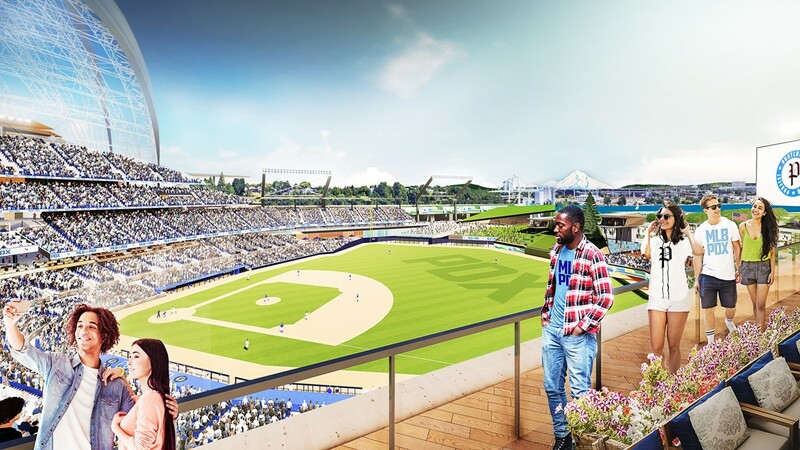 "For the past year, we’ve been highly focused on securing the best possible property for development of a ballpark and have deeply analyzed multiple sites," Cheek said. "Although additional options continue to present themselves, we are excited to announce that Terminal 2 is our preferred location and want to thank the Port of Portland for being such a great partner in this vision." Buying property, building a stadium and eventually bringing a team to Portland is a multi-billion-dollar endeavor, but we know very little about who is financing the Diamond Project effort. Wilson and his wife Ciara have come forward as investors but declined to say how much they invested. Beyond that, the Diamond Project has refused to say who is putting up the money other than to say they have people lined up. McIsaac said Thursday that the money to build the stadium is already secured but wouldn't reveal who has invested in the project. Land = ✔️@MLB Team = Soon. Fans = Forever. 🌹🌹🌹@Ciara, myself, & our Partners @PDXDiamondProj are 🔥🔥🔥up about bringing a @MLB team to an amazing city and community. Barrett has estimated it will cost more than $1 billion just to build a stadium, plus it could take another $1 billion to purchase a team. Portland Diamond Project has several people on staff and a roster of advisers and vendors. Public records show Portland Diamond Project community relations advisor Nathan Nayman met with Portland city officials on at least two occasions. Nayman met with the director of the East Portland Neighborhood Office on Oct. 4 and met with the director of the Portland Office of Civic and Community Life in August. Portland Mayor Ted Wheeler tweeted in support of the plan on Thursday, saying it "would have a positive impact on our economy while shaping the next great PDX neighborhood."